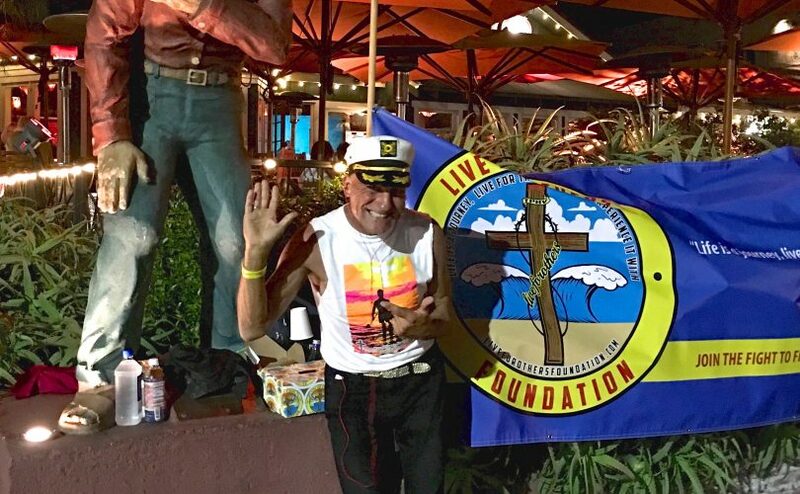 Michael Minutoli, Laguna’s latest Greeter, is planning a 24-hour Greeter-Thon fundraiser this coming Saturday, March 31, in memory of Timothy Vorenkamp, a young man who passed away from a rare cancer two years ago at the age of 18. While in high school, Tim had worked part-time as a host at Sapphire Restaurant, located just steps from the corner where Michael spends his days waving to passing cars and pedestrians. Tim started college at UC Berkeley in September 2015. Five weeks later, he grew very ill and returned to Orange County, where he was admitted to CHOC. Tim’s doctor told him that he had only weeks to live. The young man – determined to live life to the full until the very end, the way he had lived so purposefully and positively during his previous 18 years – drew up a bucket list of 11 things he wanted to do before he died. One was to have lunch with Michael. “He wanted to know how Michael had such an amazing happy vibe despite living on the streets some of the time. He saw the same attitude in Michael that he believed in himself, that we live for others, and it is so important to stay positive,” Petra says. Tim had been diagnosed with a rare cancer (synovial cell carcinoma) at the age of 13, but nevertheless excelled in sports at J Serra, including in surfing and volleyball. Before he passed away, he had already generated $50,000 for Make A Wish and his own Live for Others Foundation, founded to fund cancer research. After Tim’s death, Chef Azmin of Sapphire Restaurant told Michael he needed to see him in his office. And there to greet Michael the Greeter were Timothy’s parents and his family pastor. Michael had known nothing of Tim’s wish list up until that point. “They told me, the day he passed away, he said to them, ‘Listen, I didn’t get to fulfill my wish list and Michael was on it,’” the Greeter says. “By then he had met Kobe Bryant and he had driven an Aston Martin at 100 mph. [But still] he said Mom, you’ve got to go tell Michael I wanted to have lunch with him and I want him involved in my Foundation. And then his parents told me they wanted me to be part of his paddle out. That’s when Michael decided to do something practical to honor Tim’s memory. In the first year, Michael raised $1,100; last year, he raised $1,400. The Greeter-Thon is scheduled to take place this Saturday, March 31 through Sunday, April 1 on the corner of Coast Highway and Brooks Street, the Greeter’s usual spot. Just as a donation to Tim’s Foundation may make a difference in some child’s life, sometime, somewhere, someone the Greeter may never know. People can also donate through the Live For Others Foundation website at https://l4of.org. The Live For Others Foundation (L4OF) is dedicated to finding a cure for synovial sarcoma, a very rare form of soft-tissue cancer diagnosed primarily in teenagers and young adults. In an act showing an incredible generosity of spirit, the Vorenkamps are planning on making a “Timothy room,” a hospice room, in their house on Oak Street, where a young person can go to die in peace by the beach.